Remember that cute little guy from The Lord of The Rings, the one with big hairy feet that saved middle earth? We are going to chat about him today. Frodo is one of my biggest heroes. May seem strange, but the second I “met” Frodo I instantly fell in love with him and felt connected to his character. There have been many times where I have felt the way he does. Just a small little being in a giant universe, with a task that is way to big for me to fill. I question often if I am the right one for the job or why me? I have often thought, there is someone much smarter, faster, more faithful and more fitting for this task. Just a quick overview of Frodo. He is a hobbit that lives in the shire. The shire being a place of beauty, joy, laughter, dancing and merriment. A place where most of it’s inhabitants rarely leave and don’t have any desire to explore what is on the boundaries of their land. They are happy and content living in their own little world of safety and security. Frodo is approached by Gandalf the Grey and is instantly put in charge of what one might call the heaviest burden one can bare, yup I am thinking saving the world might fall under that category. When it came to Frodo and his life calling all the odds were against him. His size, his experience, his knowledge, his strength, and so forth. We know hobbits are tiny is stature and they aren’t the sharpest tools in the shed, but they are hard working and honest. They love life, laughter, food and the comforts of home. In the midst of great turmoil, fear, and danger hobbits somehow each seem to rise up to the challenge. Somewhere in those tiny bodies this great spirit of courage arises with an energy that they can barely contain. Frodo went up against all odds and fought. He didn’t know if he could do it and he was almost always scared of the unknown and what may lie ahead. Frodo’s journey was difficult, relentless, and the road seemed to be full of obstacles one after another. Like our own lives Frodo was faced with things he didn’t expect and things he wasn’t prepared for; or had the opportunity to prepare for. He continued forward with great courage and faith in the journey, no matter how unfit he was for the job. Through humility and perseverance he quickly became the person to complete the undertaking. Frodo had a certain loyalty to himself and his fellowship that he was not going to ever let them down. His friends didn’t necessarily believe that he was going to complete the job, but they didn’t shy away from supporting him in his cause. The thing is they all had faith. They all knew there was a task at hand that they couldn’t ignore, or pretend wasn’t happening. Sometimes I wish Gandalf was my grandpa. His response couldn’t be any better. “So do all who live to see such times, but that is not for them to decide. All we have to decide is what to do with the time that is given us”. I am not sure if any of you are like me, but there have been many a day where I have been ready to throw in the white towel. I would often wish that certain things would have never happened, because they broke my spirit down to little pieces and I never thought I could assemble everything back together again. 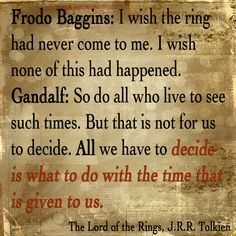 Gandalf’s words and Frodo’s example have always inspired me. It truly is not up to us to decide certain aspects of our fate, but we can indeed decide how we are going to live each day with the hand we are dealt. The mornings here often bring a lot of fog. At first the fog scared me, because the distance that was clear ahead was very short. I ultimately came to the conclusion that to get to where I am going I only need to see a few feet ahead of me at a time. As I continue to move forward another few feet of fog clears up and so forth, as I travel toward my destination. Commit to moving forward even if you don’t know the way. Just saying I can do this and I will do this is the first step. Often times the way will appear all by itself. “And yet their wills did not yield, and they struggled on”. If there is a will there is always a way. When I was young I loved to dance, but couldn’t afford dance lessons. Dancing brought me so much joy and there was a very strong will there so I found a way. My mom took my sister and I each monday to clean the dance studio and that was how we payed for our classes. It wasn’t the easiest way to get what I wanted, but I wanted to dance so we figured out a way to make that happen. “No taste of food, no feel of water, no sound of wind, no memory of tree or grass or flower, no image of moon or star are left to me. I am naked in the dark, Sam and there is no veil between me and the wheel of fire. I begin to see it even with my waking eyes, and all else fades”. Frodo comes to a point in his journey where he hits rock bottom. I have been there before. It is exactly like Frodo described it. A dark and dreary place, where you can’t find love or warmth. A place where hunger doesn’t exist, not because your hunger has been satisfied, but because you are on the brink of giving up so you know longer desire the taste of food or life. So dark you have no where to go, but up. You can come back from rock bottom. It may be the bottom, but it is not the end. People hurt our feelings and vice versa. Sometimes we’d love to fight back with some unkind words or give them a piece of our mind, but most of the time that makes matters worse. The opposite of revenge is compassion, forgiveness, grace, mercy, and reconciliation. These feelings can be powerful tools if we decide to throw revenge out the door and take action on these attitudes. Like Frodo, we may not seem fitting for the journey, responsibility, or endeavor, but we were made to rise up to the challenges life may bring. Like the ring was meant to go to Frodo we too are meant to face certain tasks even if the fear is there. Wonderfully poignant, heartfelt, honest and real. Thank you for your writing!